Justification: lettering and style (Erhardt). Miletos . Found in Akköy. Now in the Antikensammlung in Berlin (inv. no. PM 2839). Marble block with preserved margins on the left and right, but broken at the top and bottom. The left and right margins appear to be essentially preserved. Edition here based on Ehrhardt Milet VI.3 1219, with ph. pl. 41 and further refs. Cf. also: Sokolowski LSAM 44. The document is typical of ritual norms for cults and priesthoods in many respects, yet unusual in at least one notable regard. As commonly interpreted from the first extant line, it appears to be a regulation that applies to all of the individuals who happen to purchase priesthoods in the city of Miletos (cf. Sokolowski). The practice of the sale of priesthoods is indeed relatively well-documented in Miletos (cp. CGRN 100 and CGRN 138), as well as widespread in other cities of the Western Aegean (cf. e.g. Erythrai, LSAM 25). Yet this observation also raises several intriguing questions about the context of the present document, which at the present remain difficult to resolve. General contracts for all priests or a general contract of sale of priesthoods are not otherwise attested. Why would the city of Miletos choose to regulate its priesthoods in this way, and in the following century apparently offer individual priesthoods for sale with more specific contracts? We must presume that the context of the regulation was clarified in earlier lines of the inscription, now missing. Perhaps an alternative interpretation would be that the city sold a limited but specific number of priesthoods for civic cults on this occasion (τὰς ἱερε[ω]σύνας, line 2), which were then regulated in the contract or regulation which followed. Whatever the precise case may be, the regulation proposes general rules about the privileges of the priesthoods, specifically the prerogative parts of meat which were received by the purchasers. Different cases are outlined: first, when the city performs a sacrifice (lines 3-8); then a list of portions which are apparently to be assigned by lot (8-10); next, the case of the sacrifice of an ox (lines 10-13); finally, sacrifices offered on an individual basis (lines 13-15) or by foreigners (lines 15-16, otherwise missing). Lines 3-8: It was common practice that priests receive all (or at least most) of the skins from sacrifices offered by the city (or by a group), but not from those offered by private individuals: cp. CGRN 50 (Chios) and CGRN 118 (Halikarnassos), lines 9-14 . The prominent exception to this norm was the sacrifice of oxen, whose hides were extremely valuable: see also here below, at lines 10-13. For the remaining portions, it is worth stressing that a virtually identical list can be found in sales of priesthoods from a later period at Miletos: CGRN 138 and LSAM 52. For the kidney, often singled out as a special privilege of priests at Miletos and its periphery, cf. CGRN 138 (Milet), line 16; cp. CGRN 81, line 21 and CGRN 122, line 5 (both from Thebes-on-the-Mykale). The word σκολιόν can be thought to designate specifically the more 'twisted' or 'coiled' small intestine, to be distinguished here from the large intestine which is treated separately (see χορδίον at line 10). For the so-called 'sacred portion', see Dimitrova, who collects the relevant testimonies. However, it is not certain that the expression is an alternative term for the ὀσφύς as Dimitrova argues (that term in fact occurs at Miletos itself, cf. 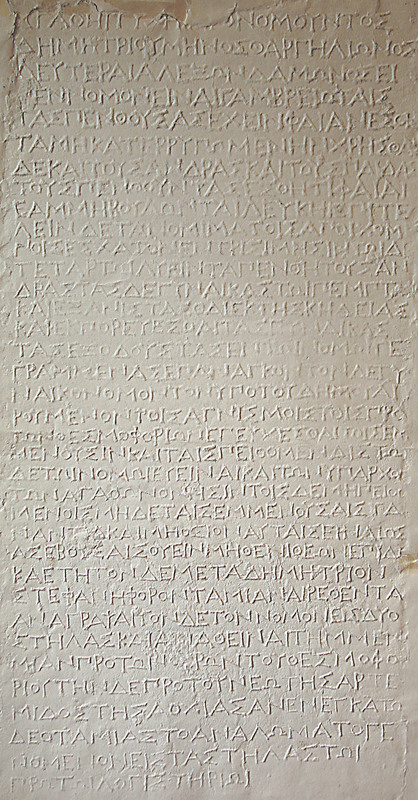 CGRN 100, line 2); the "sacred portion" should rather be paralleled with the term θεομοιρία, found for instance on Kos of a divine portion "derived from the shoulder": cf. CGRN 86 D, lines 19-20. For the importance of the tongue as a priestly perquisite, cp. the evidence from Chios, e.g. CGRN 41, line 9. Lines 8-10: The word ἀπόλοχον is not otherwise attested, but it can reasonably be thought to derive from the verb ἀπολαγχάνω. As such, it ought to introduce a list of portions obtainable by the drawing of lots (cf. Sokolowski, citing Wilamowitz). It thus seems envisaged that other portions which sometimes be normally attributed to priests (such as the legs), are to be allocated among the participants at civic sacrifice: this applies apparently also to the remaining meat of the animal, as well as to two more specific portions, the stomach or a portion thereof, and the large intestine of the animal (χορδίον). The stomach was used to make tripe, and the diminutive term γαστρίον may be used here to designate some of the chambers of this organ which are preferable for this purpose (the first three?—the abomasum is glandular and less commonly eaten today). For the use of the bowels to make sausage, see also here at lines 10-13 and cf. CGRN 57 (Aixone), lines 4-5, 9, etc. Lines 10-13: The case where an ox is sacrificed appears to resume the list of expected priestly perquisites and is apparently to be distinguished from the civic sacrifices mentioned in lines 3-8 (the rules mentioned there might apply to all other animals, except oxen). In this case, the priest receives only two divided portions of meat and apparently no hides (as in the private sacrifices, lines 13-15). But he or she also obtains other sizeable portions: all of the bowels from the ox (χόλιξ is a technical term for bovine bowels, cf. LSJ s.v. and contrast χορδίον in lines 8-10), as well as a single blood-pudding (αἱμάτιον, cf. LSJ s.v. III; cp. here CGRN 86 A, Kos, line 53: αἱματίου ὀβελὸς τρικώλιος) and portions from the head. The latter are somewhat unclear: the term κορυφαῖον might be thought to refer to a part of the head of the animal, specifically its top (cf. LSJ s.v. II); it is unlikely to designate the whole head of an ox. It is worth noting that, in the plural, the term probably parallels an another word for the "extremities" of the head, ἀκροκώλιον, probably the nose, ears and other tender portions cut from the skull. That word is found at nearby Didyma (I.Didyma 482, lines 4-5: τῶν δὲ ῥυνχέων καὶ τῶν ἀκροκω|λίων, which are to be sold; ca. 300-250 BC) and also at Ephesos (I.Ephesos 1263). CGRN 39, l. x-x (http://cgrn.philo.ulg.ac.be/file/39/).